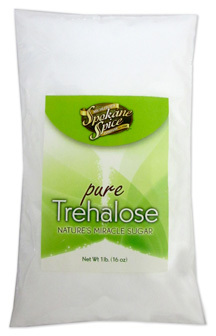 Trehalose is Nature's miracle sugar. It has a double molecular structure that helps prevent dryness. Added to fresh sausage at the time you are adding seasoning will give a flavor boost and extend the fresh taste of frozen fresh ground meat. It is about 45% the sweetness of sugar. Adding 6 ounces of trehalose to one gallon of water well greatly increase the life of fresh fish. Place the fish in the solution, refrigerate over night, then cook, package or freeze.